For optimal performance on all craft materials. Dual temp for optimal performance on all craft materials - use high temp setting for wood, plastic, leather, and low temp setting for delicate materials like foam. Trigger fed for optimal glue flow. 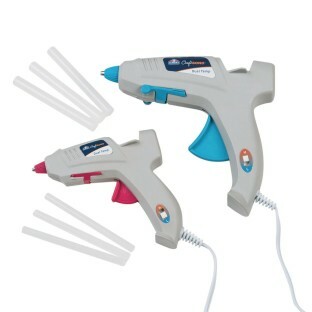 Enhanced safety features include insulated nozzle to safeguard against burns, auto-shut off if gun overheats, side lifts allow gun to rest safely on its side preventing glue back-up. 40W.